Early Bird discounts available until May 31st. Buy Italian Grand Prix tickets from these official retailers. Spectators watching F1 at Monza are spoiled for choice with a surprisingly varied array of views around what is a track consisting mostly of long straights split up with chicanes. 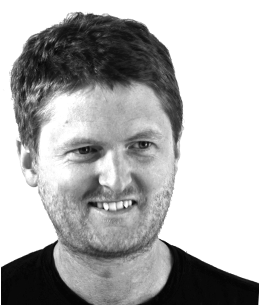 There’s no clear winner in the general admission verses grandstand debate with good views for all and a general sense that you get what you pay for. Grandstands at Monza are for the most part steel or concrete bleacher style seating, and not renowned for their comfort. Get up for a stretch often and if you’re a bony bum, bring a cushion. Grandstands on the main straight at Monza put you right in the Ferrari red heart of the action. 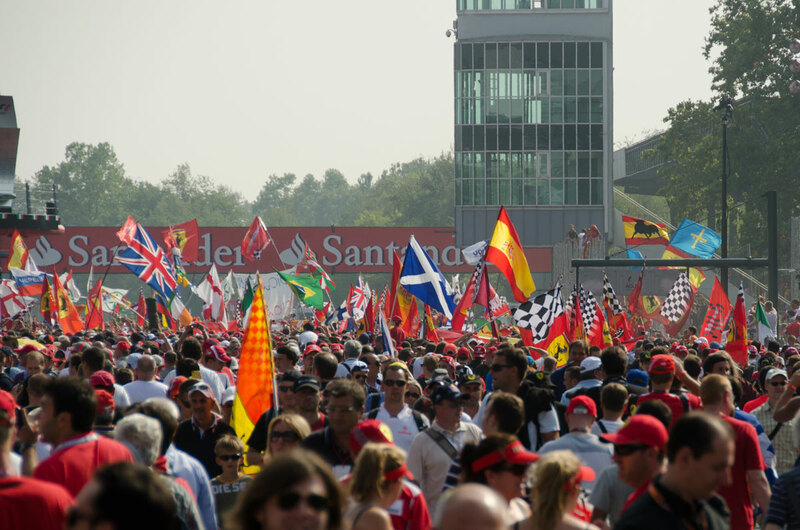 Whether you’re in the giant, throbbing hoard of fans in Laterale Destra or one of the many smaller grandstands that line the pit straight the atmosphere here is unparalleled at Monza or any other Grand Prix circuit. 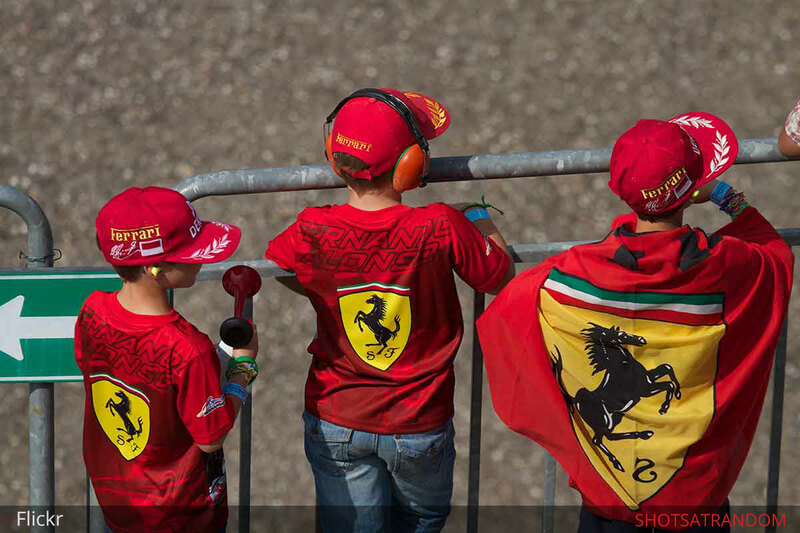 Ferrari fan or not, being among the passionate tifosi here is an unforgettable experience and come the end of the race your’e in a prime spot for the most famous track invasion of them all. 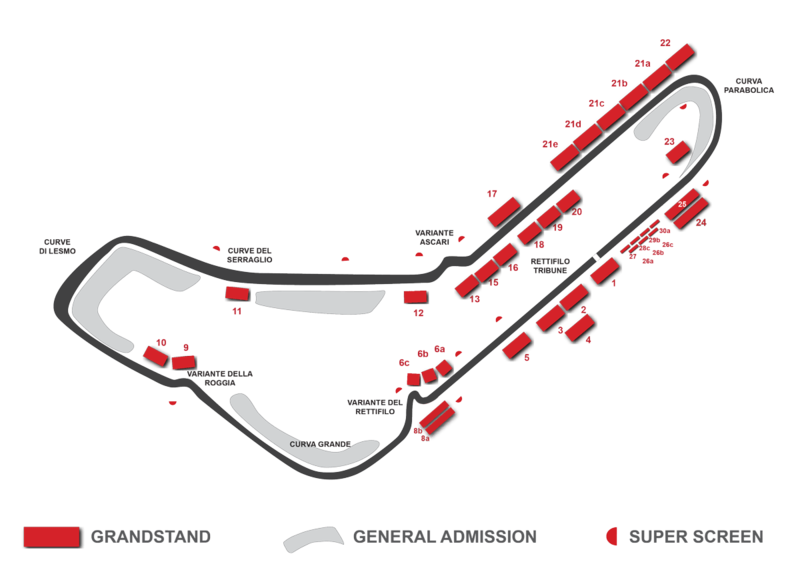 Laterale Destra – or if you prefer Grandstand 26 – is a large grandstand that borders the grid and is the best place to be to experience the build up to the race, all the action in the pits and the podium ceremony. It stretches from the first few rows of the grid (though the first row is best seen from Centrale Grandstand) all the way down to where fans have a distant view of the long, drawn-out exit of the Parabolica. From this end (block 1) you have the best seats at Monza to watch the podium celebrations without even moving a muscle. The Centrale Grandstand (1) is itself a part of Monza’s epic history, hosting Grand Prix spectators since it was constructed in 1938. The two blocks on the right hand side of the stand are opposite the grid with the pole position markings being roughly opposite seat 58 in block 2, near the central partition. Note that this grandstand is only partially covered and if sat in the lower rows you may be exposed to sun for some period of the day and be more effected by heavy rain. Shouldered by Monza’s evocative banking there is even a sense of history here at what is the circuit’s newest corner – the re-profiled Alta Velocita turn 1. It’s one of the seasons tightest first corners and there’s often clashes here on the first lap. Coming after a long straight it’s always the scene of the most overtaking. Grandstands on the interior of turn 1 just have the edge over Grandstand 8, benefiting from a broader view of the braking zone on the approach to the chicane giving a better chance to see the complete move. The fencing covers the view of the track on the approach but given the distance you won’t find it too intrusive unless you’re a serious photographer. At the chicane there is a clearer view of the cars. Grandstand 6C, closest to the apex is the most sought after view but 6B at a slightly lower price point is worth considering. Bring a long range telescope if you’re in 6A however as its quite a distance from the corner. You’ll be able to tell the difference between a Ferrari and a stray cat but its too far to appreciate the drivers skill in negotiating this turn. The best views of the corner are from higher up, but with foliage blocking the view in the other direction, seats in the mid rows are best. In some respects the view from Grandstand 8 is better than its neighbor on the other side of the track. The view as the cars enter at and then round the chicane is of the front and side more than the rear before they scream off towards the Curva Grande. Higher rows of the pricier 8B Grandstand have a clearer view of the chicane but unfortunately much of the view of the approach is blocked by some overhanging tree branches. The royal park’s protected flora aren’t so much of a menace in 8A, but being lower down beside the safety fencing fans here don’t see much more of the breaking zone. The Seconda Variante (that’s second chicane to you and me) offers a cheaper alternative to some of the turn 1 grandstands but with a similar view, Grandstands 9 and 10 represent good bang for buck. The Lesmos one and two are nearby so should you feel like a change of scenery at any point you won’t have to go far. Okay, its not the first corner but on lap one the cars are still very much tightly packed, jostling for position and though overtakes are less common here they are certainly not rare. Neither are accidents and incidents. The corner has staged several lap one pile ups over the years as well as many awkward spins on the supersized rumble strips. In 2018 tifosi hearts sank as Vettel collided with Hamilton here, hampering the Ferrari driver’s championship bid. There’s not a lot of difference between grandstands 9 and 10 but with a closer and more direct view of the entry to the chicane, as well as views unhindered by the ubiquitous fencing (upper rows only), Grandstand 9 just edges out its neighbor as the best grandstand at the second chicane. Grandstand 10 (Rogia) is more attractively priced and has a view of the cars racing off towards the first Lesmo. The chain link fence covers your view of the chicane but on the exit fans have a clear sight of the track. The giant screen is a little further away from the grandstand but it shouldn’t effect your decision too much. Named for the Italian double world champion who lost his life at this part of the track in 1955, the Ascari is a fast sweeping chicane towards the end of the lap. You’re much less likely to see overtaking moves occur here, or any incidents, but watching F1 cars thread though here at speed is sublime. Situated directly opposite the entry to Ascari the track here is perfectly parallel to the grandstand, but with trees blocking the approach, most of your view here will be of the rear of the cars as they negotiate the chicane. The best grandstand for views of Ascari is Grandstand 13, at about the midpoint of the chicane. From here the elongated view of the cars appearing from the Monza woodland is a majestic sight. The grandstand is perfectly positioned for clear views of the approach entry, exit and the straight leading to the Parabilica, resulting in the maximum amount of track visible from any one vantage point. There’s little to choose between these two grandstands. Each have excellent views of Ascari. They are closer to the exit but not positioned so well to view the approach and the following straight. Grandstand 15 allows a better view of the entry, though it’s still really too distant to be of any real value and Grandstand 16 is a better vantage point to see cars exit. From grandstands 18 and 19 you’ll have a head on vision of the action through Ascari, then at a distance almost close enough to touch, see cars exit onto the straight, kissing the rumble strip as they do so. In the event of a downpour you’re quite literally covered, but infuriatingly for many spectators you’ll find the structure that holds up the roof also serves as an obstacle between you and the track. Another famous corner with a tragic history. In 1961 the Parabolica was the scene of the fatal accident of Wolfgang Von Trips, who’s Ferrari somersaulted into the crowd killing 15 spectators. Nine years later, Jochen Rindt lost his life following an accident when his Lotus suffered a brake shaft failure in practice. Thankfully F1 drivers and spectators are a lot safer these days and it’s a joy watching Formula One cars storming into Parabolica, braking from about 340 to 180kph while trying to maintain as much momentum as they can for the long straight that follows. The lower priced Grandstand 21 which is comprised of 5 sections (A, B, C, D and E) is generally better avoided (dito grandstand 23). There is one exception. 21A, nearest the apex and with a giant screen opposite has similar views to its higher priced neighbor. If you don’t mind being exposed to the sun and rain this grandstand offers a good value view of the Parabolica. Further away the corner is too distant to really see anything and the view gets very old very quickly. If you really want a reserved seat then go for it, but for most spectators just a general admission ticket would be preferable. Many of Monza’s intrinsic charms lay in elements of the experience not related directly to how good the views are. The atmosphere and the history; these are things that you can enjoy from just being in the place and with general admission tickets for Monza being some of the most affordable in Europe it’s a clear winner for many. Monza has a rambunctious crowd and frankly it’s worth the general admission ticket price for the chance to be among the tifosi. General admission offers some worthwhile viewing options with paths winding their way through the trees around the circuit and views from just about every angle. There are a number of small viewing platform erected for general admission though these spots disappear fast. More likely you’ll find yourself pressed against the perimeter fencing. The spectator experience is not the best for un-obscured fence free photographs but it is at least close to the action. Regulars of of Monza’s general admission take the best spots very early on, putting down sleeping bags to stay overnight in the park and even roping off entire sections. It’s a bit of a free for all so just get the best spot possible whether that means climbing a tree, scaling the roof of a service building or just jostling like hell for position. My pick for the best general admission spot has to be the second chicane – the Variante Seconda. This is a common place for overtakes, braking hard after the Curva Grande – an action packed piece of asphalt, particularly on lap one. The position benefits from a superscreen and is also close to the two Lesmos making a strategy of hopping between the two areas during the latter stages of the race a great way to get a change of scenery. Other hot spots include Variante Ascari – there won’t be much in the way of overtaking but it’s worthwhile to see the F1 car’s mesmerisingly fast change of direction. Turn one is always likely to see a lot of action and is a prime location for the stampede to the podium once the gates are opened after the race. Monza has arguably the best podium of the season, jutting out over the start finish straight in iconic fashion. Bagging standing room under it is the place to be come champagne time. Track invasions are commonplace at circuits these days but Monza has been doing these since the days before other circuits were even a twinkle in Herman Tilke’s eyes. There are access points around turn 1 and at the other end of the straight near the Parabolica, though from these areas it is still quite a run to the podium area. A better option are openings in the fence near Centrale Grandstand (1), opposite the podium and another a short distance back from the podium near one of the tall glass paneled towers that line the main straight. These are the closest access points and you’ll need to be reasonably nimble to jump the waist high barrier and advertising hoarding onto the track. Wherever you are on the circuit you’ll be able to get onto the track after the race once the track marshals open the gates and you’ll have ample time to explore. But if you want to get a taste of the winners champagne you might consider this when choosing where to watch the race from, or make your way to one of these areas in the closing stages of the race.